Ok so the first bit wasn’t really about racing, more about the preamble. This is the race proper. Awaking early, 04:30, we made a quick breakfast of eggs, toast and coffee before one final check of our kit and out the door to get tagged (CP dibbers & GPS tracker) and onto the buses for the trip to the start at Curraghmore House in Waterford. It is at this point that the true usefulness of race buffs becomes apparent, as a blackout cloth over your eyes. Mike and I slipped easily back into a slumber and only stirred as we approached the gates of the big house. The start location is nothing other than stunning! 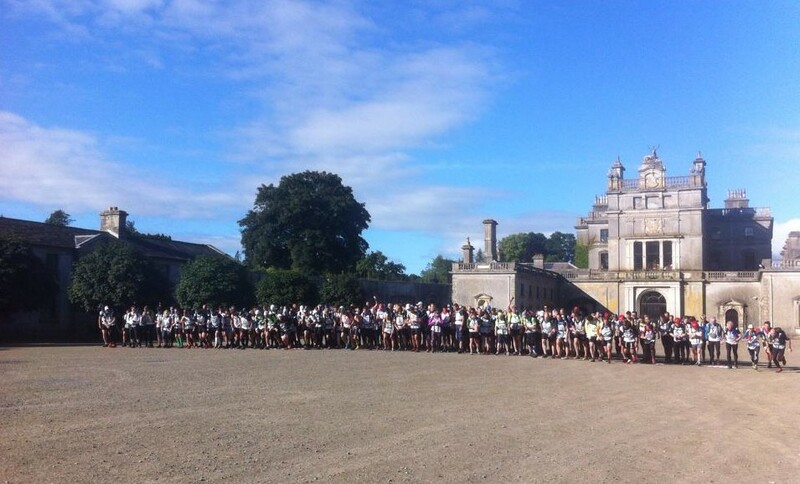 Teams will start out in the splendid courtyard of Curraghmore House and follow a marked trail until they reach TA1. There will be a marshal checking teams through on route. At TA1 teams will dib TA1‐in to access their Kayak/Wet bags and dib TA1‐out before entering the water. •The trail will be marked by a series of markers (red arrows on a white background and blue and white tape. ), teams must stay on this marked route until they reach TA1. •TA1 will have Kayak/Wet bags which contain wetsuits, PFD’s & Backrests as well as Paddles & Kayaks. •Teams must load their wet bags into vans before dibbing TA1‐OUT for transport to TA3‐IN. •There are limited toilets facilities available at the start line, teams should take advantage of the toilets available on the coaches. So with an update on the proposed finish time being 08:35 on Sunday morning at the latest, Ivan counted us down and we were off!! 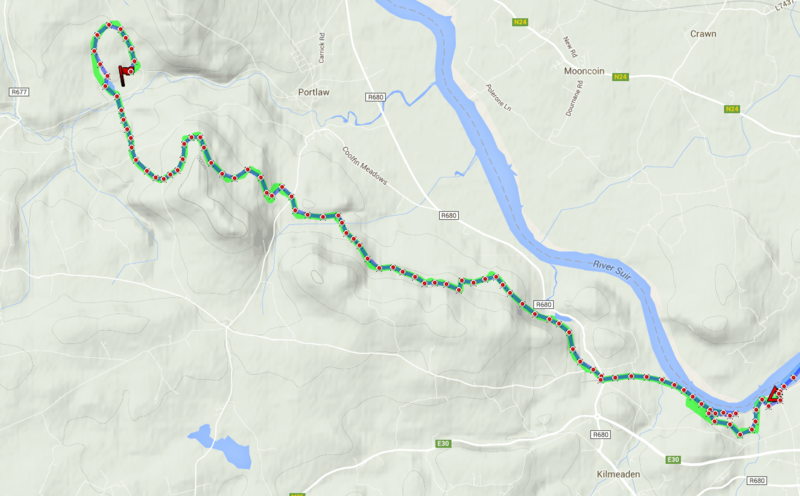 The Beast of Ballyhoura 2015 race was under way!!! The first loop out the courtyard gate and around the house dragged up a hill which very quickly brought many of us to our senses and we adopted our plan of walking the uphills and trotting the flats. Remember we probably have 10kg worth of gear, food and water on our backs too in order to get us right through today. Most of Stage 1 was along trail. Some sections were along quiet back roads but by far the most eye catching section was the ‘Stand By Me’ run-along-the -railway line piece from Kilmeaden to Mount Congreve. We had been warned that this small gauge line becomes active at 11am so we were on a countdown to get on and off the line or risk being routed around by road. The half hour delay to the start put this under pressure but we did it. Coming off the rail line and into the grounds of Mount Congreve for some reason my inner horticulturalist came to life and I was identifying plants left and right. The estate is magnificent (stunning) and as we wound our way to through the nursery area to TA1 and the boats I was marvelling at the size of the greenhouses. Into TA1, grabbing the backrests and paddles Mike and I made our way to get boats while Kate changed shoes. We had to pause at TA1-out for the others but quickly fitted our labelled backrests to boats, lifted them onto the railway lines and readied for the lowering down the bank. 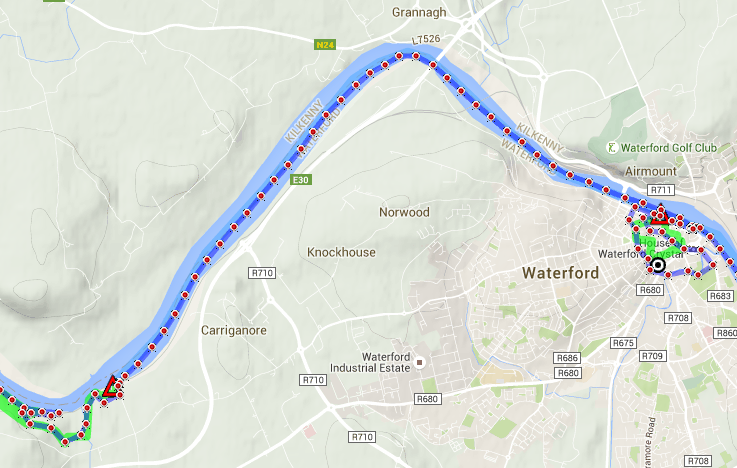 Teams will paddle down stream until they reach the marshal on the quayside jetty at Waterford city. Here teams will have to carry their kayaks from the jetty to the nearby plaza and dib TA2­ ‐in before they start a short foot orienteering section around the City of Waterford. Teams will have to run a short distance to Rice bridge to collect their maps for the foot orienteering. Mike went first and sank to his knees in deep, sticky mud. We lowered the second boat and Shane and I dropped down and pulled the boat over the mud. It went everywhere! Our kayaking plan, as we were not planning a tow line, was Mike & Kate in one boat and Shane and I in the other. It meant for a more balanced setup than usual. Man these kayaks are unstable!!! Back in and with a 1 and a 2 we stroked and set off again. The rest of the trip was pretty uneventful. The paddle down stream was nice. There was a decent flow in the middle of the river which we took advantage of all the way down to the City jetty. Roughly an hour after setting off, we were lifting out the boats and drag/carrying them up the ramp to the plaza, dibbed out and ran to collect the map further up the river bank. This was the first section that we were about to earn points so we were really excited. We also made relatively short work of this section in 36 mins (working off the tracker history) and the stand out memory was the four of us bursting through the doors of a shopping centre like escapees from an institution, bypassing Burger King (wouldn’t happen tomorrow I tell you!) and out the other side into the square. Back down to the pier and we soon stopped laughing as we put in and began kayaking the long leg that would lead out to sea. Teams will continue paddling downstream towards Duncannon Fort where they will have a short 200m foot section to pick up control K4 and then back in the water to K5 before making their way to TA3. K4 and K5 are MANDATORY checkpoints, unless bad weather alternative routes are in use. Back on the water and the progress was decreasing as we seemed to be battling a changing tide. We guessed we had a running tide on the first section as the water level was lowering along the banks. We were in the port and mixing it up with other boats on the water. We stuck to the sides but wake waves made for some hairy moments as well as channel markers where, eddies were churning up around breakwaters. We spun like a top at one stage and learned very quickly how to recognise the different water textures. Rounding the Russian Side (see image above) we were met with a standing wave which is the most surreal thing I have ever seen. It was set up by a passing motorboat, ran about 1.2m high and just sat there, mid channel. We had to cross it to get tucked into the headland on the Eastern side in order to make it through the ferry crossing at Passage East and on to the CP. You can see by the closeness of the GPS tracker marks how slow the progress was here, there was a lot of ‘vertical’ waves with water dancing as river current met tide and water was being pushed around on top of its self. 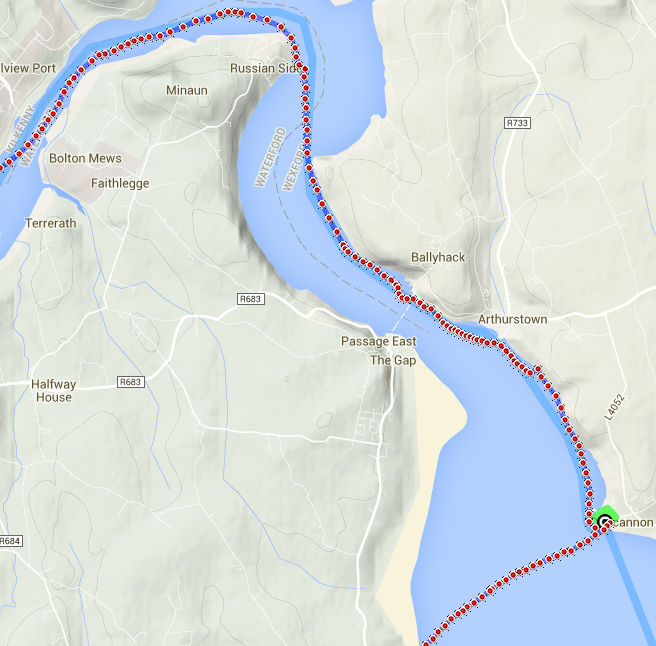 We put in South of Arthurstown for a brief moment to stretch and pull on the waterproof gear to help maintain warmth. We also ate and drank as with the concentration on keeping moving forward and stability we could not afford to stop paddling on this stretch. Back on, we hit the beach at Duncannon Fort and creakily exited the boats to dip in for our next lot of very hard earned 1000 points. Arriving back to the kayaks we were welcomed with the unwelcomed, welcoming news that the field was being ‘bad weathered’. We were also updated that only the top 3 teams had proceeded to CP K5 and were going the long way round to Dunmore East. Mike and I swapped boats, the paddling was taking alot out of us, in particular the stern seat where we were putting a lot of pressure on the right side to keep the boats straight on the waves and power to stop us spilling. We stroked across the bay, head to wind and wave and less than 1 hours later we were carrying boats out and prepping for the run to Dunmore East and the next stage. We all quickly warmed up and hamstrings began to creak as they loosened up and we even managed to trot on the roads down. Trotting down the road, Mike was skipping with joy at the idea of the swim. We all were to be honest. Down the road, down the steps and in we went swimming across to the first bit of rocks to collect 1000 points at the LifeBelt. Over the rocks and back in the far side to collect the next 1000 points!! We got held up a little as Mike’s calf muscles went into lockdown simultaneously with his shins. Shane got stuck in under the water trying to hit a triggerpoint to get the release before we swam over to the railings where Kate was waiting patiently for us to dip in for the next 1000points. You could hear the hollering and screaming as we scrambled up the next set rocks to be met with the ‘Special Task’ element…an 8m drop off a cliff into the water below. This was class!! We then had a straight 800m swim from here to the beach and up the ramp to the TA where picking up our gear we were directed to the Caravan site where our bikes & kit bags were waiting. Advised that the second section of coasteering was cancelled we modified our plans and only had to head to C13 on the route before continuing onwards. We weren’t planning on the bonus orienteering section on Tramore Beach so it was a straight shot for us to the next stage. We left TA around 21:20 and settled in for the long bike ahead. We had a couple of CP’s to check in with along the way and made contact with B9 roughly an hour later and hit B10 just before 23:00. Not much to remark about the bike other than getting it done. It always seems to be the same for me on night bikes, the time and distance pass without me noticing too much. The only hiccup was we diverted to dib into TA5 which we discovered was a mistake as with the Coasteering cancelled there was no need to visit this area. Onwards we went hitting C13 for another 1000points at 23:30. As we came out a flurry of teams arrived behind us. Unfortunately though a broken chain meant we had to pause for a quick repair, less than 10 mins later we were off again and making good ground.